TRAUMA founder/vocalist Don Hillier says,"TRAUMA is thrilled to be going back out to play live shows with our exciting new lineup. We are looking forward to seeing our West Coast fans!" Listen to TRAUMA's recently released new track, "The Rage", produced by guitarist Joe Fraulob, below via Soundcloud, or stream the track via Spotify. The track will be featured on the band's upcoming third album, which they are recording right now with producer Juan Urteaga (TESTAMENT, MACHINE HEAD, M.O.D.). TRAUMA was born in California's Bay Area in 1980, a crucial year for metal music. It was within that fertile musical climate that TRAUMA developed a sound evoking the electric energy in the air around them. Donny Hillier consumed a steady diet of LED ZEPPELIN and BLACK SABBATH and shared a love of JUDAS PRIEST and IRON MAIDEN with original guitarist Mike Overton. And of course there was TRAUMA's legendary early bassist, Cliff Burton. TRAUMA is highly revered by those in-the-know as an important evolutionary entity in the intersection of traditional heavy metal, the New Wave of British Heavy Metal, and the more melodically minded classic rock influenced bands on the Sunset Strip. TRAUMA is responsible for the much sought after classic '80s album, Scratch And Scream, featuring killer cuts like "The Day All Hell Broke Loose" and "Lay Low". Three decades passed before the reconfigured band reemerged in support of a re-mastered edition of their debut and delivered its 2015 follow-up, Rapture And Wrath. With reverence for the past but eyes sharply focused on the future, TRAUMA entered 2017 preparing new material for what is certain to be a landmark third album, staying true to the signature sound that came before but with a very modern edge. Soaring melodies and fierce riffs collide in TRAUMA's new songs - equal parts sharp, fierce, grandiose, and theatrical. Since their formation, they've assembled the strongest elements of seemingly disparate strains of metal, with passion and proficiency. Instantly familiar vocals and melodies merge with modern riffage in the TRAUMA of today - a band that stands renewed and reinvigorated with a new lineup of seasoned players functioning as a supergroup assemblage centered around a classic nucleus. In addition to the new inclusion of former TESTAMENT bassist Greg Christian, TRAUMA co-founder/vocalist Donny Hillier and longtime TRAUMA drummer Kris Gustofson put together a monstrous lineup of amazing players. 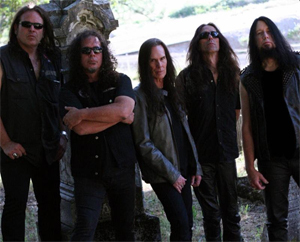 Guitarist Joe Fraulob is a former member of multiplatinum hard rockers DANZIG and DECONSTRUCT, and Steve Robello played guitar in DUBLIN DEATH PATROL - the Bay Area supergroup formed by the singers of EXODUS and TESTAMENT - and was also formerly with the group HEIST. Stay tuned for more news on TRAUMA's new album, coming soon.